The Transfiguration of Christ is the culminating point of His public life, as His Baptism is its starting point, and His Ascension its end. Moreover, this glorious event has been related in detail by St. Matthew (xvii, 1-6), St. Mark (ix, 1-8), and St. Luke (ix, 28-36), while St. Peter (II Pet., i, 16-18) and St. John (i, 14), two of the privileged witnesses, make allusion to it. About a week after His sojourn in Caesarea Philippi, Jesus took with him Peter and James and John and led them to a high mountain apart, where He was transfigured before their ravished eyes. 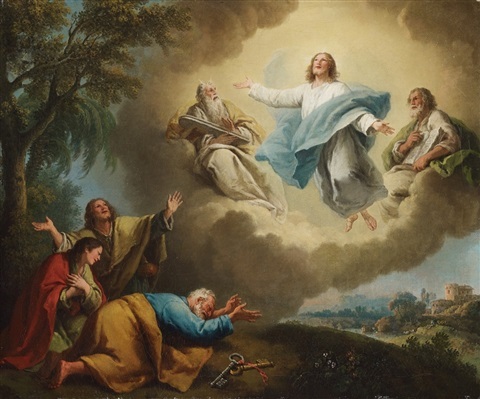 St. Matthew and St. Mark express this phenomenon by the word metemorphothe, which the Vulgate renders transfiguratus est. The Synoptics explain the true meaning of the word by adding "his face did shine as the sun: and his garments became white as snow," according to the Vulgate, or "as light," according to the Greek text. This dazzling brightness which emanated from His whole Body was produced by an interior shining of His Divinity. False Judaism had rejected the Messias, and now true Judaism, represented by Moses and Elias, the Law and the Prophets, recognized and adored Him, while for the second time God the Father proclaimed Him His only-begotten and well-loved Son. By this glorious manifestation the Divine Master, who had just foretold His Passion to the Apostles (Matt., xvi, 21), and who spoke with Moses and Elias of the trials which awaited Him at Jerusalem, strengthened the faith of his three friends and prepared them for the terrible struggle of which they were to be witnesses in Gethsemani, by giving them a foretaste of the glory and heavenly delights to which we attain by suffering.